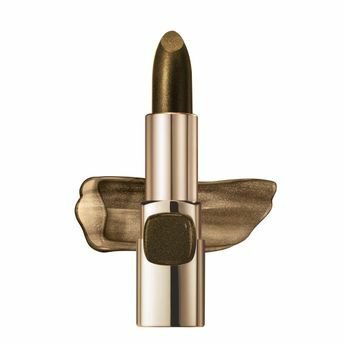 L'Oreal Paris newest limited edition Metallic Obsession, infused with the most luxurious metallic finishes. Swipe on your favourite lipstick, now available in head turning shades that add instant and subtle dimension.More than a lipstick, it is a highlighter, blush and shadow. 4 Metallic Shades to choose from: Be Bold With Pure Gold, Stand Out With Silver Spice, Subtle With Rose Champagne Or Edgy With Noir Star. Enriched with moisturising Jojoba Butter and hydrating oils. Unique and luxurious metallic packaging. Explore the entire range of Lipstick available on Nykaa. Shop more L'Oreal Paris products here.You can browse through the complete world of L'Oreal Paris Lipstick .